Simulator software: The complete set of software modules for driver training and the research simulator extensions, including the 3-display surround runtime simulation software, can be ordered separately. If you are interested in the software-only version, and want to buy the hardware yourself, here’s a list of the required specifications of the computer and other hardware. 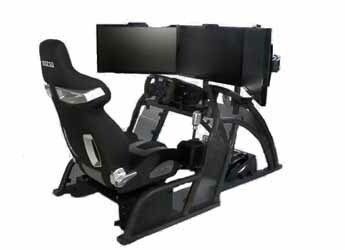 For price information including a complete desktop simulator system, see here. If you want a full system for performing the experiments, and a separate system for experiment preparation, scenario/experiment testing and data analysis, the second software licence can be purchased at a reduced price. Desktop research simulator system: A complete desktop simulator, when ordered from carnetsoft, includes the research simulator tools, the driver training and runtime software, a computer, a steering wheel, pedal and gear shifter set, 4 monitors and a sound system, plus a headtracking system. The monitors and steering wheel (+ gear shifter) are positioned on a table (not included), while the computer is generally placed on the floor. Cockpit simulator system: If you prefer a cockpit system over a desktop simulator system, with a driver seat and pedals and steering wheel mounted on the rig, there are several options, for example the cockpit of Fanatec. There you can find a cockpit, driver seat, triple monitor stand and other hardware, for example high quality pedals. For the steering wheel we recommend to use the logitech G29 steering wheel + shifter. You have to order the cockpit plus accessories from Fanatec and assemble it yourself. In that case you have a complete high quality cockpit car simulator for less than half of price compared to a similar system offered by other manufacturers. For a complete overview of prices you are referred to a separate page. The driving simulator software can be used to make a wide range of experiments in the domains of Human Factors research, driver behaviour studies, workload experiments, experiments to measure the effects of secondary tasks or in-vehicle devices, studies of impaired driving, distraction, fatigue, alcohol and drugs effects, etc. It includes all driver training simulator software as well. This gives the researcher a unique opportunity to study skill aquisition in driver training, to use all existing functionality of the driver training simulator modules (virtual environments, or databases, the script sources for numerous traffic situations) and to use the existing methodology for rating of driver errors, the virtual instructor and the student assessment system.